Yesterday, I wrote about the many Swarovski magnets in the Swarovski Crystal Moments product line. However, what I did not mention in the article is that there are also magnets that were not in the Crystal Moments product line. These Crystal Magnets without the Swarovski logo are sold in boxes that do say Swarovski on the white packaging. However, these magnets do not have any little decorations or accents like the ones in the Crystal Moments product line. For comparison sake, look at Glenn the Ghost and the (plain, unmarked) Ghost Magnet…there are no eyes. And the backside of the magnets appears to be of lower quality than Swarovski magnets with logos. A picture of cat and bat magnets with eyes can be seen in the Happy Halloween to Swarovski Crystal Fanatics article here on the Kristall Buzz. I have not seen these plain, unmarked magnets in Swarovski crystal boutiques or stores, but only at popular online auction sites. While I am certain that these plain, unmarked magnets are authentic Swarovski, this is definitely something to pay attention to when you are bidding on / buying Swarovski magnets. 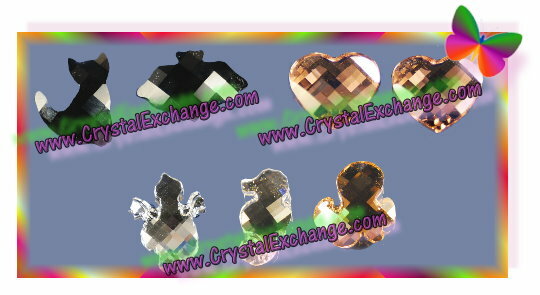 At Crystal Exchange America, we do not see much activity on the Swarovski Magnets. However, when we do have them available, they can be found by using the search feature keyword “magnet”. The listing details will indicate if Swarovski logos are present on the magnet figurines.